Are you the owner of Bear Creek RV Park in Seward Alaska? Did you know that you can convert this page to a complete listing of your services today for nearly nothing? Put your listing in front of thousands of visitors planning their trip to Alaska. Add your own coupons, pictures, services and more. Contact us today. 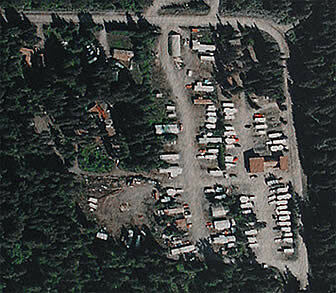 Bear Creek RV Park in Seward AK is located on Bear Lake Rd, Seward AK. Call for reservation at 907-224-5725. Bear Creek RV Park in Seward Alaska offers Seward Alaska RV Parks with hookups and more. Directions - Bear Creek RV Park in Seward AK is located ½ Mile up Bear Lake Road from the Seward Hwy. as you enter Seward AK. Bring your camera and lots of film. Bear Creek RV Park in Seward Alaska is home to an exceptional amount of wildlife, and yes, that includes black and brown bears too. I took the above photo just above the RV park of this brown bear while picking blueberries. There are plenty of bears in the Seward area and your chance of seeing one is actually pretty good when the salmon are returning to Bear Creek. When staying at Bear Creek RV Park in Seward Alaska you have an extremely diverse selection of truely Alaskan activities waiting at your fingertips. Below we list some of our favorite things to do near Seward Alaska. sled dog tours with Iditarod Champions Mich and Dallas Sevey. halibut & salmon fishing charters out of Seward AK. marine life and whale watching tours with Alaska Whale Watching in Seward AK.